Rather than blue on black. Kenny Wayne Shepherd's latest is pretty good. French blue, straight collar broadcloth dress shirt for the on blue part. 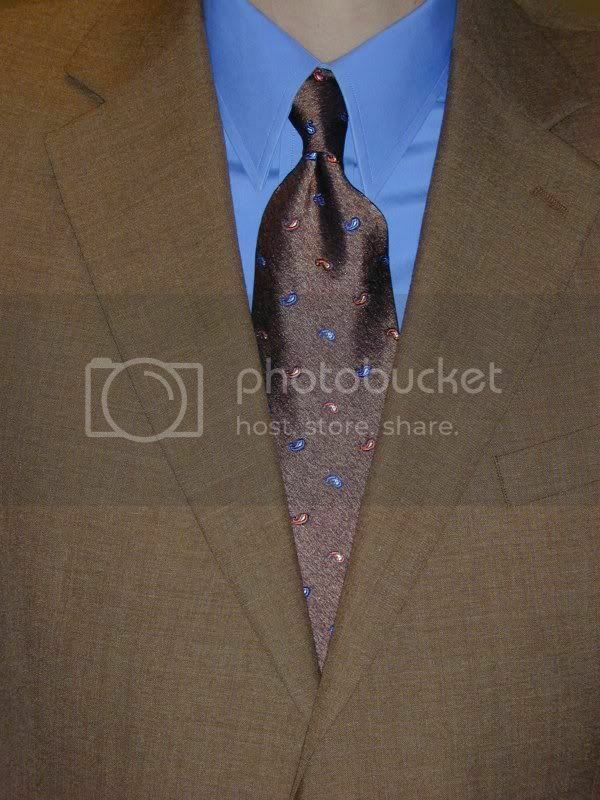 The brown on part is a another necktie by Jos A. Bank Signature. It's not as hefty as the others that I have so I ended up using a Prince Albert knot to fill in the tie space a bit. It's got little French blue and rust paislies. The center of the French blue ones is blue and the rust, white. Each is outlined in navy. The brown sport coat completes the other portion of the brown on. I had acquired a pair of rust colored trousers with just this conglomeration in mind but they are too small. Evidently I haven't lost as much weight as I thought. It could be because my eyes are often bigger than my stomach. I'd be tempted to tone things down a bit by wearing a black tie.